[Sheep is Life – Dibé bé Iiná] is a celebration of traditional Navajo shepherding and all weaving cultures. A outdoor festival showcasing Navajo weaving classes/demonstrations, Navajo cuisine demonstrations, Sheep and wool shows, professional sheep/land/Navajo churro experts presenting on Animal husbandry, wool market, sheep preservation, agricultural practices and more! Hosted by Dine College and Land Grant Office of Dine College as official partners to Dine Be’Iina Inc. The concept of Sheep to loom is starting with learning about the sheep, where it grazes, how that affects its wool and how to work with its wool. 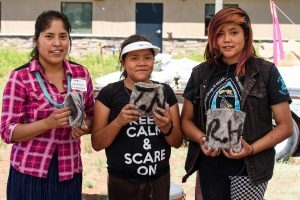 “Sheep to loom” apprentices learn about shearing, wool washing, carding, spinning raw to clean fleeces, spinning for yarn/warp, learning the anatomy of the Navajo Loom, and finding plants for wool dyeing. Meat and traditional Navajo cuisine workshops, seasonal plant walks, Traditional Navajo sheep harvesting techniques and teachings. The ultimate goals for this program is to continue the use of traditional foods (herbs, foraged herbs from the wilderness used by our ancestors and free-range harvest sheep) and to compile a set of “Navajo recipes”. We partner with professionals, entities, schools, businesses, media platforms that would like DBI to conduct a workshop or presentation or resource guide for the work we do. Inquires can be made via e-mail at info@navajolifeway.org. We seek to continue to educate individuals, communities, groups, entities about the importance of the role of the Navajo-Churro sheep (Táá dibéí) to Navajo textile/weaving history, its continued survival of this endangered breed. Dine Be’Iina partners with several groups who also share similar mission to preserve the Navajo-Churro Sheep breed. Dine Be’Iiná gives a Dine (Navajo) perspective of how the sheep plays a sacred role in Navajo creation stories to Navajo philosophy and eventually Navajo Textile history. The goal of the Presidium is to foster a viable income for traditional Diné sheepherders and weavers by establishing a niche meat market for Churro lamb and mutton, in addition to wool and fiber arts. Diné Navajo-Churro producers, to expand the market for both meat and wool, and help improve the Navajo-Churro breed. NCLP works with DBI for shared goals when project goals are align and to seek sponsorship when needed.